Dr. Saad B. Omer is the William H. Foege Chair in Global Health and Professor of Global Health, Epidemiology & Pediatrics at Emory University, Schools of Public Health and Medicine. From July 2019, Dr. Omer will serve as the inaugural Director of Yale Institute of Global Health. He has conducted studies in the United States, Guatemala, Kenya, Uganda, Ethiopia, India, Pakistan, Bangladesh, South Africa, and Australia. 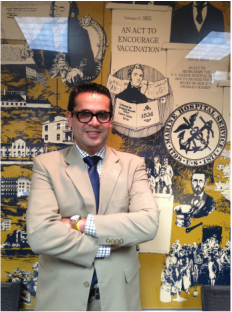 Dr Omer’s research portfolio includes clinical trials to estimate efficacy of maternal and/or infant influenza, pertussis, polio, measles and pneumococcal vaccines and trials to evaluate drug regimens to reduce mother-to-child transmission of HIV. Moreover, he has conducted several studies on interventions to increase immunization coverage and acceptance. Dr Omer’s work has been cited in global and country-specific policy recommendations and has informed clinical practice and health legislation in several countries. He has directly mentored over 100 junior faculty, clinical and research post-doctoral fellows, and PhD and other graduate students. Dr. Omer has published widely in peer reviewed journals including the New England Journal of Medicine, JAMA, Lancet, British Medical Journal, Pediatrics, American Journal of Public Health, and Science. Moreover, he has written op-eds for publications such as the New York Times, Politico, and the Washington Post. Dr Omer has received multiple awards – including the Maurice Hilleman Award by the National Foundation of Infectious Diseases for his work on the impact of maternal influenza immunization on respiratory illness in infants younger than 6 months- for whom there is no vaccine. He has served on several advisory panels including the U.S. National Vaccine Advisory Committee, Presidential Advisory Council on Combating Antibiotic-Resistant Bacteria - Vaccine Innovation Working Group, and WHO Expert Advisory Group for Healthcare Worker Vaccination. Moreover, he served as an academic affiliate of the Office of Evaluation Sciences –formerly known as the White House Social and Behavioral Sciences Team. William H. Foege Chair in Global Health – 2016: This endowed chair was established in honor of Dr. William (Bill) Foege with a gift from the Bill and Melinda Gates Foundation. Dr. Foege is a former CDC Director and is credited for devising the global strategy that led to smallpox eradication. Millipub Club Award – 2015 & 2017: Recognizes individuals who have published one or more papers that have each garnered more than 1000 citations. Awarded for 5 papers. Bruce Squires Award -2014: Presented annually to the authors of a research article in the Canadian Medical Association Journal that "promotes high standards of reporting and evidence-based medicine." Fellow, Infectious Diseases Society of America -2014: Recognizes individuals who have achieved professional excellence and provided significant service to the profession. Pediatric Infectious Diseases Society Young Investigator Award -2013: Presented by the Pediatric Infectious Diseases Society for "independent & productive research that represents outstanding contributions in pediatric infectious diseases." Maurice R. Hilleman Early-stage Career Investigator Award -2009: Presented by the National Foundation for Infectious Diseases. The award recognizes individuals in the field of vaccinology based on a specific research contribution and their overall career trajectory.